J chaturvedi, K Hegde, A Ananthamurthy, R Nayar. 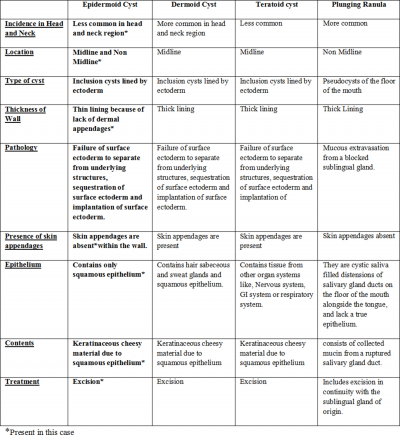 Submental Epidermoid Cyst- A Case Report. The Internet Journal of Head and Neck Surgery. 2009 Volume 4 Number 2. Epidermoid cysts are rare lesions in the head and neck and are most often located in the submental region. They are usually due to surgical or accidental events leading to traumatic implantation of epithelial cells into deeper tissues. 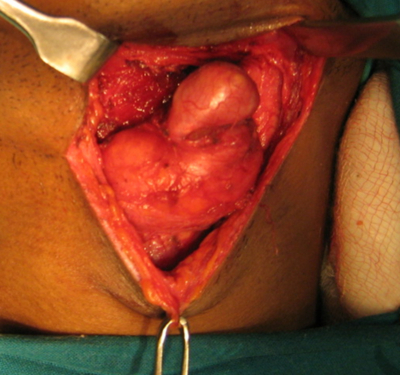 It is uncommon to find an Epidermoid cyst without this history. We operated on a 30 year old male patient who presented with a 10 year history of a slow growing painless midline neck swelling and had no history of any trauma or surgical procedures in the head and neck area. The cyst was excised under general anesthesia and found to be in the submental region extending to the left parapharyngeal area. A histopathological examination revealed a connective tissue wall lined by squamous keratinizing epithelium without any identified adenexal structures suggestive of an Epidermoid cyst. This case was noteworthy due to the absence of any apparent cause explaining implantation of epithelial cells in this region. The Differential diagnosis of slow growing midline swellings of the neck include Ranula’s, Thyroglossal cysts , Teratomas and Keratin cysts. The term Keratin cysts includes Epidermoid cysts and Pilar cysts. 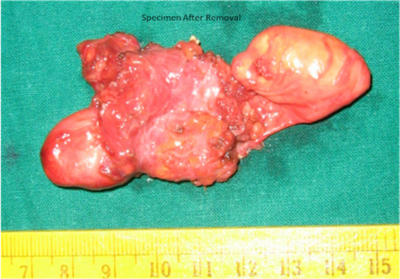 (9) Benign teratomatous lesions are Dermoid Cyst and Teratoid Cyst (7). Epidermoid cysts of the neck are rare and most often located in the submental region [Incidence - 1.6 to 6.9%] (1) (3). These cysts remain asymptomatic for a long time until they interfere with swallowing, speaking, breathing or when an infection occurs (3). They are usually due to surgical or accidental events leading to traumatic implantation of epithelial cells into deeper tissues and it is uncommon to find an Epidermoid cyst without this history. We present a case of Epidermoid Cyst of the submental region with review of relevant literature. A 30 yr old man presented in the OPD of a Tertiary Medical Centre in South India with a 10 year history of a painless slow growing midline neck swelling. There was no dysphagia, dyspnoea or hoarseness. On inspection, a single, smooth, firm 3 x 5 cm swelling was noted in the submental region 2 cm below the mandible extending upto the hyoid bone. It was soft and cystic in consistency and did not move with protrusion of tongue or with deglutition. The skin over swelling was mobile and there were no palpable Lymphnodes. 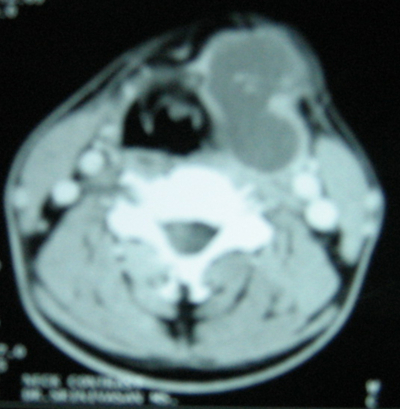 A Contrast enhanced CT of the neck showed a thin walled cyst extending superiorly up to sublingual area, inferiorly upto the pyriform sinus compressing the aryepiglottic folds and laterally up to submandibular gland and sternocliedomastoid muscle. [Fig 1] A provisional diagnosis of a dermoid cyst was made. A possibility of a plunging ranula was also considered. A Fine needle aspiration Cytology showed keratinous Cystic material suggestive of an Epidermoid cyst. FigCyst Exposed and dissected from surrounding muscles of floor of mouth, strap muscles inferiorly and laterally with parapharyngeal region atachment encountered at lower border of hyoid which was released and excised. This case was noteworthy due to the absence of any apparent cause explaining implantation of epithelial cells in this region. 5. Darrouzet V., VidalV.F., Hilton M., Nguyen D.Q., Fougere S.L., Guerin J., Bebear J.P. Surgery of Cerebropontine Angle Epidermoid Cysts: Role of the widened Retrolabynthine approach combined with endoscopy: Otorhinolaryngology- Head and neck surgery.2004;131(1):120-125. 8. Lohaus M, Hansmann J, Witzel A, Flechtenmacher C, Mende U, Reisser C. Uncommon sonographic findings of an Epidermoid cyst in the head and neck: HNO;1999;47(8):737-40.